Because of its dominating position in the single coffee brewer market, Keurig has always been the first thought of many customers. The reasons for its popularity include speed brewing time, convenience in using and cleaning up, as well as a great collection of coffee and beverage flavors. However, a long list of Keurig models and designs can make your choosing process become daunting, even to those who are already familiar with operating one. There is no brewer that satisfies all coffee drinkers’ preferences, so if you are in the market for a new/first coffee maker, know your own taste and welcome to read through our review collections, we are here to help. In this general review, we compiled a list of dozen Keurig models for comparison. Our review on different features and designs will help you navigate through all these options and pick the one that suit you the most. 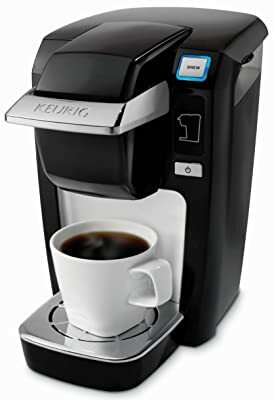 Keurig has discontinued many original brewers and currently focused on four main brewing lines including the Keurig 2.0, the Keurig K-cup, the Vue and the Keurig commercial models. The Keurig 2.0 and the Keurig K-cup are both for home use but different significantly in the acceptance of My K-cup and third party reusable coffee filter. The Vue is the only one that has milk frothing feature to allow you to brew a good cup of cappuccino or latte. The commercial line are suitable to serve more coffee in many business settings due to its large brewing capacity but couple of models can also be used at home too. 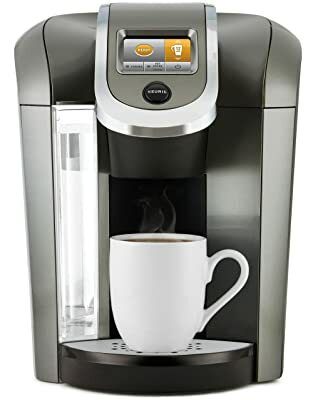 Available for sale since Fall 2014, Keurig 2.0 is the most recently introduced series by the company and the first to feature Keurig 2.0 Brewing Technology ™ which are designed to read the lids of K-cups and won’t brew if they are not licensed. The reasons underlying this restriction are mentioned to ensure the consistent quality of “a perfect beverage every time” but apparently received many complaints from loyal customers. 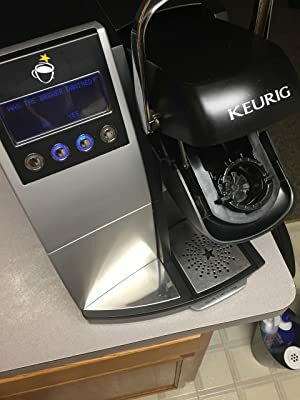 If you are previous owner of a Keurig model and intend to go for a Keurig 2.0, make sure you are aware that your current pods might have to be tossed away if they are not listed as Keurig authorized brands. 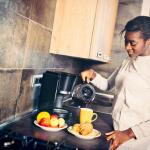 The new technology also allows users to brew both a single cup and a carafe of coffee up to 30 ounces so it will be a great convenience for those who often have guests coming over. Large water reservoirs from 60 80 oz allow more brewing cycle without having to fill water in too often. Coffee strength are adjustable for those who love bolder coffee taste. Short brewing time that takes around a minute to brew a single cup and up to 3 minutes for a carafe. UL listed for Household Use Only. All Keurig 2.0 models are programmable with just a couple of different features. One year warranty. There is no difference between a “K” or a “B” model. 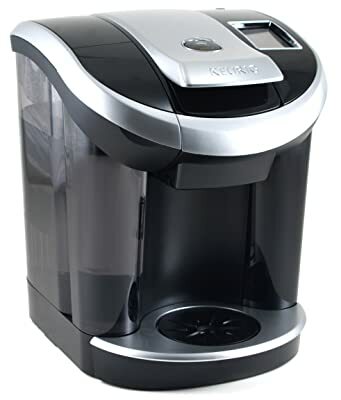 The K360/K460/K560 models are identical to their counterparts, just packaged with different assortments of K-cup samples while the K300/K400/K500 do not have the water filter. The whole package includes a coffee maker, a Keurig Carafe, a 2.0 Water Filter Starter Kit and a variety of K-cup and K-carafe samples. 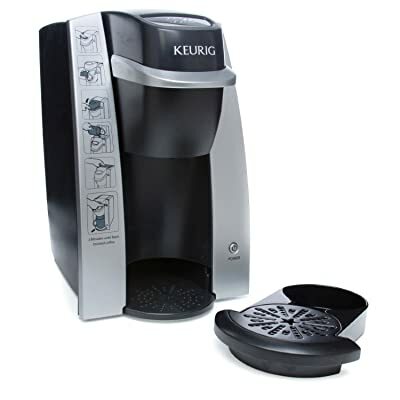 Keurig K55 is equipped with a 48-ounce water reservoir. This is pretty much a decent size and will allow you to brew several cups before the need to have it refilled. Whether it is coffee, hot chocolate, or tea, among others, you can be finished brewing in under a minute. The simple interface of this coffee makes it another thing that has been well-loved by its users. It is devoid of complications. There is a single button that you need to touch and it will start brewing. There is no need for guesswork. It also comes with a removable drip tray. This is beneficial in terms of versatility as it will be able to accommodate even larger cups. The tray also catches any drips and will keep the area free from mess. Dimension 13.0H x 9.8W x 13.3D. Weighs 12 pounds. Offered at Amazon.com. Large 70 oz. illuminated water reservoir to brew at different 9 brew sizes (4-30 oz). Come in 4 colors including Black, Marsala, Vintage Red and White. Strong control to adjust coffee taste. Colored LED 2.4” Touch Display. Auto on-off. Programmable features include language change, water filter reminder, energy savings mode, clock and favorite settings. Customized wallpaper. Auto brew a K- Carafe pod. Removable drip tray. Water filter and cartridge. No hot water dispenser but can produce by brewing without a K-cup.Dimension 16”H x 12.7” W x 18.3” D. Weighs 13.7 lbs. Power usage 1500 watt, 120VAC/ 60 Hz. Offered at Amazon.com. Large 80 oz. illuminated water reservoir with Flip top lid and customizable lid. 10 brew sizes. Strong control. Colored LED 2.8” Touch Display. Auto on-off. Programmable features include language change, water filter reminder, energy savings mode, clock and favorite settings. Customized wallpaper. Auto brew a K- Carafe pod. Removable drip tray. Water filter and cartridge. Hot water on demand with Dispenser button.Dimension 16”H x 12.7” W x 18.3” D. Weighs 13.9 lbs. Power usage 1500 watt, 120VAC/ 60 Hz. The MiniPlus and the Elite series are all Keurig K-Cup Brewing System, which are mostly different in term of the water reservoir presence. Both of them are designed for home use with quick brewing time less than 2 minutes for a single cup of coffee. Be introduced to the market way earlier than the Keurig 2.0, Keurig K-cup systems accept not only authorized K-cup but also some third party coffee capsules and especially My K-Cup filter, which allows you to brew your own ground coffee in a more economical way. The B30/K30 Mini is no longer being made. K10, B10 and B31 are actually just different names for a same single model. 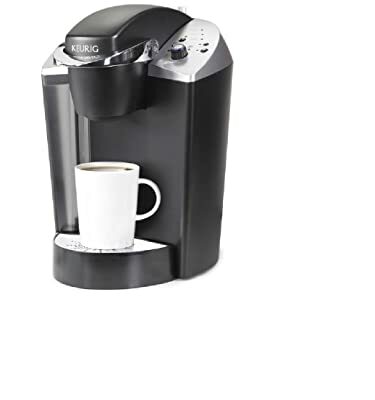 Offered at Amazon.com as the good Keurig coffee brewer that can be found. K10/B10/B31 is also the most colorful model that comes in 13 different colors. This compact coffee maker has no water reservoir so it means after brewing a single cup, water has to be fill in to start another cycle. Longer brewing time compared to the Elite series but no more than 2 minutes. Drip tray removable. Three brew sizes including 6 ,8, 10 ounces. LED indicator. Can produce hot water when for other beverage uses. Auto shut-off. Great if you are want to save more home space. Dimension 10.8” H x 6.9” W x 10.7” D. Weight 8.75 lbs. Power usage 1425 watt, 120VAC/ 60 Hz. One-year warranty. Six Keurig variety samplers on package. Sold at Amazon.com. Also available at multiple colors.48 oz water reservoir can be removed for water filling and brew 3 different cup sizes including 6, 8, 10 oz. Quick brewing time which often less than 1 minute. Quiet Brew Technology. Removable drip tray. Can produce hot water for other purposes by removing K-cup. LED indicator light. Auto shut off. Dimension 13.3” H x 9.8” W x 13” D. Weight 12 lbs. Power usage 1500 watt, 120VAC/ 60 Hz. One-year warranty. Selling package includes 12 different K-cup samplers and a Water filter kit. The K40/B40 is identical except that it can only brew 2 cup sizes: 8 and 10 oz. This section is dedicated to review the commercial brewing systems by Keurig. They are designed to work in various business settings (small to medium sizes) such as office break room, food store, convenience store, or customer waiting room, etc. Some models are best to serve up to 15 people while other have larger capacities that can be operated to conveniently make enough coffee for around 30 people. 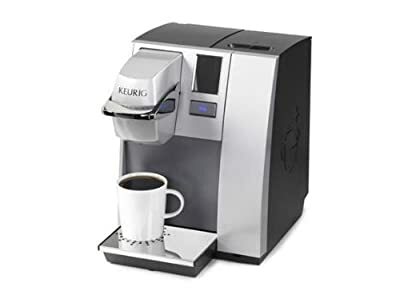 If you are looking for a brewer to make a hot cup of coffee at home and are not yet satisfied with models previously reviewed, consider Keurig K145/B145 and K155/B155 because they are UL listed for both home and commercial use. With a 90-ounce brewing reservoir, Keurig K155 the perfect choice if you always prepare coffee for a large group. It can be an excellent addition to a conference room, a small restaurant, or even a large household.It is integrated with a full color LCD touch screen, which makes its operations a snap. Here, you will be able to easily set the brew temperature as desired and program other functions. You can also activate the automatic on and off feature. Looking at the reviews that have been shared by its users, one thing that is often given words of praises is its stylish appeal. It looks boxy, yet it does not run short in terms of appearance. Dimension 16 x 8 x 10 inch. Weighs 6 pound. Power usage 1400 watt, 120VAC. 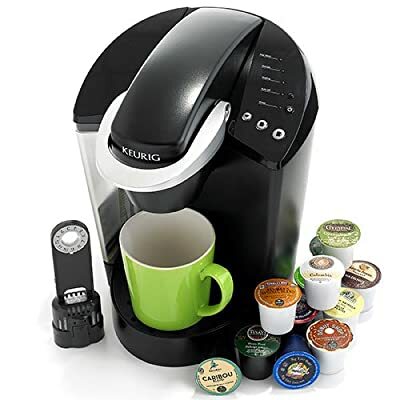 The Keurig K140 Commercial Brewing System works best in small office setting to serve up to 15 people. Available for purchase through Keurig authorized distributors only. Three cup sizes: 6,8, and 10 ounces. Refillable water reservoir of 48 ounce capacity. Quick brewing time that is less than a minute. Accept K-cup and some third party reusable filters. Removable drip tray. No dispenser but can produce hot water by brewing without a K-cup. Auto turn off after 2-hour not using. UL listed for Commercial Use Only.Dimension 13.3”H x 11.4” W x 9.5” D. Weighs 14 lbs. Power usage 1400 watt, 120VAC. The Keurig B145 OfficePRO is another brewing system used for small office setting which is pretty similar to B140. Three cup sizes: 6,8, and 10 ounces. Refillable water reservoir of 48 ounce capacity. One minute brewing time. Accept K-cups but not compatible with My K-Cup reusable filter. Removable drip tray. No dispenser but can produce hot water by brewing without a K-cup. Auto turn off after 2-hour non use. 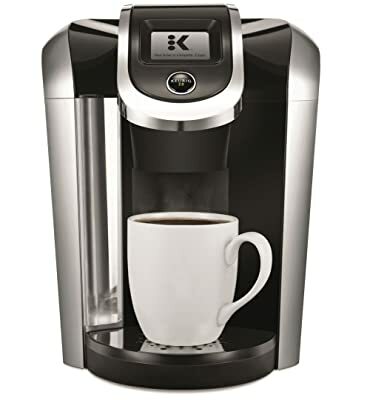 UL listed for Household and Commercial Use.Dimension 13”H x 10” W x 11” D.
The Keurig K150 Commercial Brewing system is available for purchase through Keurig authorized distributors only. Large water reservoir up to 90 oz with optional water plumbing kit that allows your machine to be hooked up to a water line. Five cup sizes include 4,6,8,10 and 12 oz. Brew coffee and other beverages in less than a minute. 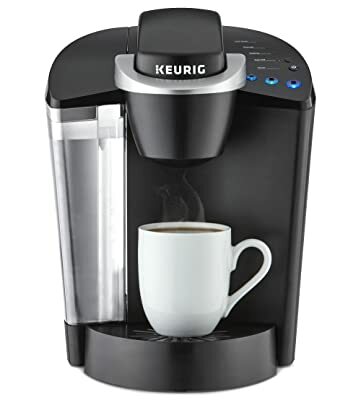 The Keurig B155 OfficePRO Premier Brewing System is for larger office setting which can serve up to 30 people. Can be purchased online at Amazon.com. Four cup sizes 4,6,8 and 10 oz. Large reservoir holds up to 90 oz of water. Brew coffee and other beverages in less than a minute. Full programmability including water temperature adjusting. Auto On/off. Interactive touch screen with multiple language setting. Less noise with Quiet Brew Technology. Not compatible with My K-Cup reusable filter. Optional water plumbing kit. 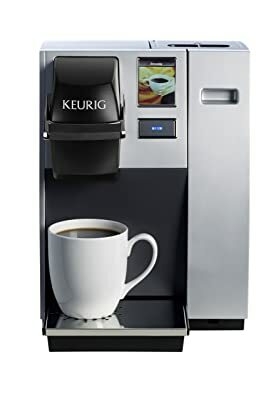 UL listed for Household and Commercial Use.Dimension 13.9”H x 10.4” W x 14” D.
The Keurig K3000SE Commercial Brewing System is another choice to consider for coffee maker at large office/ food service setting of 30 people or more. Four cup sizes 4,6,8 and 10 oz to brew from intense to mild espresso. Optional direct water plumbing allows you to continuously making each cup of coffee every 60 seconds. My K-Cup reusable filter is not compatible. Interactive touch screen with multiple language setting for step-to-step guideline. Hot water on demand. Removable drip tray. Automatically eject K-cup after brewing to build-in storage. UL listed for Commercial Use Only. Certified by the National Sanitation Foundation (NSF) for use in food service outlets.Dimension 17.4”H x 18” W x 12” D. Weighs 35 lbs. Power usage 1400 watt, 120VAC. Keurig Vue appears as an innovation to coffee maker industry. It has been bringing about the users the most advanced features ever which satisfy even the most difficult-to-treat users. Yeah, if you like really hot coffee, Vue brewer prides itself being an item which is able to make really hot coffee. You can also make full control over temperature, so you can adjust to have coffee at your desired temperature. In addition, unlike K-Cups, Vue pods are completely recyclable. So you will never have to worry about contributing to landfill after enjoying your cup of coffee. One more amazing things is that Keurig Vue comes with better control panel, just by touching the color touch screen you can program the machine an absolute breeze. Last but not least, it provides you with more cup sizes. Yeah, you can choose from up to 8 sizes. So if you need coffee when going out, your Vue will accommodate your travel mug without any trouble. You can adjust your coffee to brew extra hot and you’ll enjoy your to-go coffee for a longer time. In other words, It Keurig Vue gives you better customization, easier way to use the machine and hotter, more delicious coffee. And most importantly, all of these amazing features are all available in various models of Vues, from the old versions like V500, V600, V700 to the recently-launched like V1200. SO are you ready to enjoy these wonderful coffee makers right now? Together with Keurig Vue, The Keurig Kold is a new product by the famous coffee maker brand, Keurig. 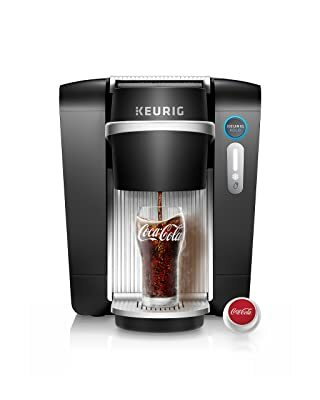 Unlike Keurig Vue and some other models by Keurig, Keurig Kold is major in making soda and other carbonated drinks from pods which is slightly bigger than the coffee K-cups you’ve probably used before. These pods include not only the soda flavoring but also special beads packed with CO2, which will get released into the drink when it’s being made. The Kold offers beverages at a nice chilled temperature as if you have get the beverage from a fountain soda dispenser at a fast food joint. One more thing, Keurig Kold is in partnerships with big-name soda brands like the Coca-Cola Company, which means that you can use the Kold to make old favorites such as Coke, Sprite and Dr. Pepper… more than that, Keurig can also some flavors of its own, like flavored seltzer and a sports drink. The Keurig Kold is plan to go head-to-head with the parallel devices from SodaStream, a rival home carbonation company which has had a close partnership with PepsiCo. These two devices face headwinds to satisfy users’ demands and provide them with the best beverages ever. SO are you curious to discover this amazing Keurig Kold right now? To answer the foremost question on which coffee maker is the best deal for you, there are a list of things you should look out for. How much you are willing to pay for a coffee maker to stop your daily trip to a coffee shop, which features a brewer normally have that you don’t want to miss, and which one you can just pass to save a few dollars. The pros and cons of each Keurig model are specifically related to your own need so knowing all these below information will be a great help for final decision. Keurig models come at various prices ranging for commercial use machines. The availability of different features will affect prices, so check your allow budget and weight carefully on the features you really want. Once you find your favorite favor, buying at large quantity can save money. Another tip to reduce java cost is to brew your own coffee ground instead of buying K-cup by using reusable My K-Cup filter. However, keep in mind that not all Keurig coffee makers accept My K-Cup filter. To be precise, none among Keurig 2.0 series does. 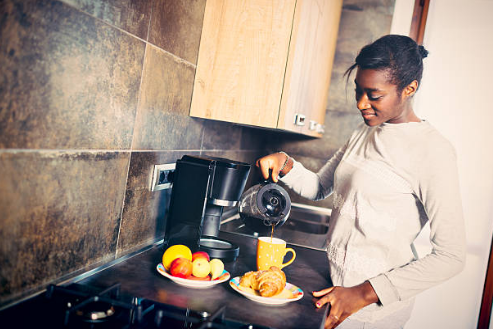 Moreover, other options including extended warranty and accessories such as drawer, K-cup storages and water filter kit can also add up to the cost of a Keurig brewer. These are optional but might be necessary on specific situation. Sure, a Keurig coffee brewer is to give you a delightful cup of joe. However, it is very important to make sure if you want to have your own coffee treat at home or the machine is going to be shared by many people in a larger office setting. A home use coffee machine is usually suitable for a couple of servings while in the later case, you need to look for a commercial use one. Other than just for durability matter, it is about safety. Most Keurig models are UL listed for Household Use Only. It means there are some restrictive standards at home that an office setting can not meet for them to work properly. In contrast, a UL-listed Commercial Use Only should not be brought home. Keep in mind that any problem with your brewers related to wrong placement will not be covered under Keurig warranty. It’s better to plan some possible spaces for your future coffee machine in advance. A secure, stable counter with easy access to water and even some extra storage for K-cup is preferable. Then you will need to know the details on size and weight of each machine to make sure if it fit to any of your designated positions. All Keurig coffee machines are countertop models. Under cabinet or build-in units are not available as space-saving options, instead Keurig has offered Under Brewer Drawer that you can conveniently place your brewer on top and turn the whole set into a under cabinet one. Check it out if you are short on kitchen space. While there are some coffee makers that only allow you to brew single cups, home use Keurig models are pretty flexible in their capacities. Various options range from 4 to 12 oz per cup, which mean you can either choose to have an espresso (normally 4-6 oz cup size) or milder tastes (for travel cup) depending on what you want. Larger brewing capacity are furthermore very handy in case of guest serving because you will need to make more than a cup of coffee at a time. Tea, hot chocolate or other beverages can also be brewed by one with several brewing options too. K-cup adaptability is another important feature that you need to pay attention to when choosing a Keurig brewer. Please note that Keurig 2.0 series do not simply brew coffee pre-packaged in any capsule/pod but only work with Keurig-approved K-cups. This sounds like a limitation of choices but don’t worry because there are up to 300 different K-cup beverage flavors from dozens of famous brands available out there for you to enjoy. 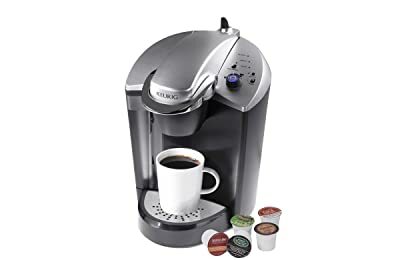 However, if you want to save the budget for your daily coffee fix a little bit by using K-Cup reusable filter and your own coffee ground, or it is challenging to find Keurig-approved K-cups in your area, you probably should check out the Keurig K-Cup series including Mini Plus, Elite or OfficePro. Water reservoir is a container that holds water to be used for a coffee-making cycle. The compact models of Keurig Mini Plus have the smallest (and static) reservoir that are able to make a single cup of coffee only. Other machines have bigger reservoirs so it is extremely convenient to make several cups of coffee without having to fill in water too frequently. It works to save brewing time by keeping hot water on hand as well. All Keurig models are capable of producing a hot cup of water or more for other uses such as tea, hot chocolate or other beverages. Models with a hot water dispenser button will make it easier for you . You should consider cup height access to see if there is enough space for tall cups like travel mugs. If not, at least the drip tray should be able to be removed to increase the height when needed. This feature is also handy for cleaning and maintenance. Some people often forget to shut off their electronic device after using and it draws energy. Hence, auto-off function are highly appreciated from energy saving perspective. However, more than that, this is actually a must-have safety feature. It prevents burning hazard when there are some coffee left on and unattended. Some Keurig models will wait as long as 2 hours but most will be automatically turned off 90 seconds after finishing brewing. Some coffee machine gives you choice to prepare your joe cup the night before by setting brewing time in advance. So if waking up to the aroma of coffee brewing sounds like a nice way to start your day, then you probably want to bring home a coffee machine with programming function. Other programmable features include customized clock, night light and wall paper of screen display. Among Keurig models, most employ Quiet Brew Technology to lower brewing operating noise while some do not. If you are sensitive with noise, this feature might be important to you. The less features a Keurig has, the more user- friendly it is. But generally, operating a Keurig brewers could hardly be a challenge to anyone. All you need to do is fill water in the reservoir, choose your K-cup and insert it in the coffee chamber, get your empty mug ready on the tray, choose the cup size (if your machine provides this option) and that’s all. Voila, enjoy your coffee. Cleaning up requires a little more effort but it is also designed to be as simple as possible. Read your product’s manual to be aware of special requirements if there is any and google for useful tips and advices. Optional in some machines to remove off unpleasant taste in water for better cup of coffee, tea or beverages. Also optional in some models (mostly commercial ones) to directly plumb water to your brewer’s reservoir. There is no hurt checking out available accessories at store. There are many interesting items that might attract you such as mugs, tumblers, drawers, K-cup storages or carousels, etc. Small or big, black, red or blue, stainless or not, choose the design that fits your style the most. There are several rankings on best coffee makers. Keurig models are often mentioned here and there so it’s good to know how it is rated among many other brands. Detailed reviews on each model are helpful once you’ve narrowed down to a couple of choices. And user rating is another factor that may affect your decision. Not all personal, short reviews are accurate and applicable to your situation but reading through them can be helpful because they reflect real life experiences which are often ignored or overlooked by producer.